Carolyn Forché was born in Detroit in 1950, her mother was a Czech-American journalist, her father a tool and die maker. Forché calls herself a 'junk-heap Catholic' - she is perpetually drawn to issues of social justice, and describes her work as 'poetry of witness'. In this respect, her work derives from a tradition of c20th European political poetry: it is a testimony to people whose lives have been barbarized by events beyond their control. Forché studied at Michigan State University and gained an MFA from Bowling Green State University. Her first collection Gathering the Tribes (1976), won the Yale Younger Poets Prize. One of the judges, Kenneth Rexroth dubbed her: "a genuine proletarian poet." Much of this early work belonged to a tradition of confessional poetry - first person lyrics focusing on family, sexuality, and remembered places – but a significant shift occurred after a year-long Guggenheim fellowship took Forché to El Salvador. Working closely with Archbishop Oscar Humberto Romero, a human rights activist later killed by right-wing assassins, Forché assisted in finding people who had disappeared and reporting their whereabouts to Amnesty International. Her volume dealing with this experience, The Country Between Us, appeared in 1981, just as America's complicity in El Salvador's civil war came to public attention. Although the collection was turned down by several publishers before eventually being accepted by Haper and Row, it caused an immediate sensation. The most disturbing poem in The Country Between Us: 'The Colonel', appears as an Archive recording. Forche describes it as ‘documentary’: the military were puzzled why a 27 year old poet who didn’t work for the US Embassy, might come to El Salvador – and took her to meet the Colonel, as she describes. The diction in which Forché relates the encounter is simple and matter-of-fact, drawing together the domestic with the shocking. (We are shown, for instance, a pistol lying on a cushion next to pet dogs and daily papers, while a teenage daughter files her nails nearby.) Tension is further increased by the unexpected intrusion of heightened poetic language ( 'the moon swung bare on its black cord over the house', for instance, which summons the image of a light bulb in an interrogation room). At the poem's close and climax, a sack full of ears resembling 'peach halves' is poured onto the table, then brushed to the floor - an image which is at once grotesque, pitiful and admonitory: 'Some of the ears on /the floor were pressed to the ground'. In 1992, after ten years work collecting material, Forché published Against Forgetting, an anthology of "the poetry of witness." She has said that she sees the book as "a symphony of utterance, a living memorial to those who had died and those who survived the horrors of the 20th century." At a personal level, the book enabled her to break through the writer's block she had suffered since the publication of The Country Between Us , since she was eventually able to interpret the voices she had gathered as being in some sense notes for her own work. She says of this experience: "I realised that now it was emerging as something intact in and of itself. And yes, there were absences in it and disruptions in it, and there was not this discernible first-person voice sustaining itself and gathering momentum.... No, this was something ongoing and building, interrupting itself and shifting course." 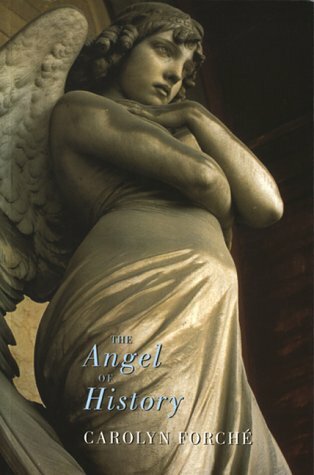 The Angel of History (1994) was the fruit of this new way of working, taking its title from Walter Benjamin's Theses on the Philosophy of History - and also its Preface, which states that because the angel of history sees the past as "one single catastrophe", Benjamin would "like to make whole what has been smashed" even though he suspects that he has been rendered helpless. In notes at the back of this book, Forché writes: 'The Angel of History is not about experiences . . . these utterances issue from my own encounter with events of [the 20th] century but do not represent 'it'. The first-person free verse, lyric-narrative poem of my earlier years has given way to a work which has desired its own bodying forth: polyphonic, broken, haunted, and in ruins, with possibly no restoration." 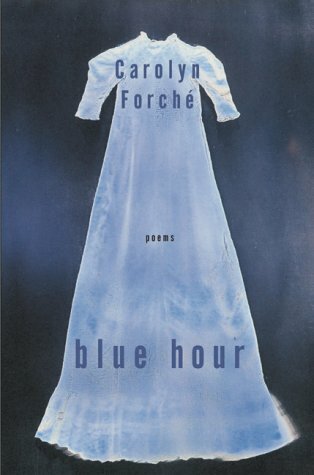 Much the same could be said of Forche’s next collection, The Blue Hour (2003), which she says belongs to a time of life that is 'between the night of the soul and its redemption.' 'On Earth' – a long poem which presents the thoughts of a dying person in an abecedary – is a good example of what she means: although it originates in particular dramas, it expands to create a moving meditation on the whole of human existence. A section of this poem appears on Forchés powerful Archive recording, in which listeners will hear her voice sinking almost to a whisper on occasion, drawing the audience in as she both laments and preserves the stillness of the blue hour. This recording was made made by the Poetry Foundation on on 1st March 2008 in New York.